How is it that even Germany needs an economic stimulus? Sometimes we have an opportunity like the image of Janus with two heads to look at an event from two different perspectives. This morning’s trade data for Germany is an example of that. If we look at the overall theme of the Euro era then the way that Germany engineered a competitive devaluation by joining with weaker economies in a single currency has been a major factor in this. According to provisional results of the Deutsche Bundesbank, the current account of the balance of payments showed a surplus of 16.3 billion euros in February 2019, which takes into account the balances of trade in goods including supplementary trade items (+19.1 billion euros), services (-1.1 billion euros), primary income (+6.2 billion euros) and secondary income (-7.9 billion euros). In February 2018, the German current account showed a surplus of 19.5 billion euros. The large surplus which as you can see derives from its trade in goods feels like a permanent feature of economic life as it has been with us for so long. Also it is the bulk of the trade surplus of the Euro area which supports the value of the Euro although if we shift wider the Germany trade surplus is one of the imbalances which led to the credit crunch itself. So let us move on as we note an example of a currency devaluation/depreciation that has been quite a success for Germany. The theme of the last six months or so has shone a different perspective on this as the trade wars and economic slow down of late 2018 and so far this year has led to this. Germany exported goods to the value of 108.8 billion euros and imported goods to the value of 90.9 billion euros in February 2019……After calendar and seasonal adjustment, exports were down 1.3% and imports 1.6% compared with January 2019. We can add to that by looking at January and February together and if we do so on a quarterly basis then trade has reduced the German economy by a bit over a billion Euros. Compared to last year the net effect is a bit under four billion Euros. One factor in this that is not getting much of an airing is the impact of the economic crisis in Turkey. If look at in from a Turkish perspective some 9% of imports come from Germany ( h/t Robin Brooks) and the slump will be impacting even though if we switch to a German view the relative influence is a lot lower. On Friday we were told this. There was an upwards revision to January and if we look back we see that the overall number peaked at 108.3 last May fell to 103.7 in November and was 105.2 in February if we use 2015 as our benchmark. So there has been a decline and we will find out more next month as March was a fair bit stronger than February last year. These give us a potential guide to what is on its way and it does not look good. Based on provisional data, the Federal Statistical Office (Destatis) reports that price-adjusted new orders in manufacturing had decreased in February 2019 a seasonally and calendar adjusted 4.2% on the previous month……..-8.4% on the same month a year earlier (price and calendar adjusted). If we switch to the index we see that at 110.2 last February was the peak so that is a partial explanation of why the annual fall is so large as for example March was 108.6. But it is also true that this February saw a large dip to the weakest in the series so far at 101. 2 which does not bide well. Also you will no doubt not be surprised to read that a decline in foreign orders has led to this but you may that it is orders from within the Euro area that have fallen the most. The index here was 121.6 last February as opposed to 104.6 this. On Thursday CNBC told us this. Although they should be eating a slice of humble pie after that effort last autumn. The private sector surveys conducted by Markit were a story of two halves. Despite sustained strong growth in services business activity in March, the Composite Output Index slipped from a four-month high of 52.8 in February to 51.4, its lowest reading since June 2013. This reflected a marked fall in goods production – the steepest since July 2012. In terms of absolute levels care is needed as this survey showed growth when the German economy contracted in the third quarter of last year. The change in March was driven by something that was eye-catching. intermediate and capital goods producers in contraction. A truism of the Euro era is that the ECB sets monetary policy for Germany rather than for the whole area. Whilst that has elements of truth to it the current debate at the ECB suggests that it is “The Precious” which takes centre stage. There is a German element here as we note a Deutsche Bank share price of 7.44 Euros which makes any potential capital raising look very expensive especially to existing shareholders.. Also those who bought the shares after the new hints of a merger with Commerzbank have joined existing shareholders in having singed fingers. Maybe this is why this has been floated earlier. Will he provide a list? I hope somebody at least pointed out that the Japanese experience of doing this has hardly been a triumph. It all seems not a little desperate as we see that ECB policy remains very expansionary at least in terms of its Ivory Tower models. It’s ability to assist the German economy has the problem that it already holds some 511 billion of German bonds at a time when the total numbers are shrinking, so there are not so many to buy. This from Friday suggests that should the German government so choose there is plenty of fiscal space. According to provisional results of quarterly cash statistics, the core and extra budgets of the overall public budget – as defined in public finance statistics – recorded a financial surplus of 53.6 billion euros in 2018. That is confirmed by so many of Germany’s bond having a negative yield illustrated by its benchmark ten-year yield being 0% as I type this. The catch is provided by my junkie culture economics theme. Why after all the monetary stimulus does even Germany apparently need more? In addition if we have been “saved” by it why is the “speed limit” for economic growth now a mere 1.5%? What is happening with US house prices and its economy? Sometimes it helps to look back so let us dip into Yahoo Finance from the 17th of December last year. Home price growth has slowed for six consecutive months since April, according to the S&P CoreLogic Case-Shiller national home price index. And for the first time in a year, annual price growth fell below 6%, dropping to 5.7% and 5.5%, in August and September, respectively. October home price results will be released later this month. So we see what has in many places become a familiar pattern as housing markets lose some of their growth. There was and indeed is a consequence of this. 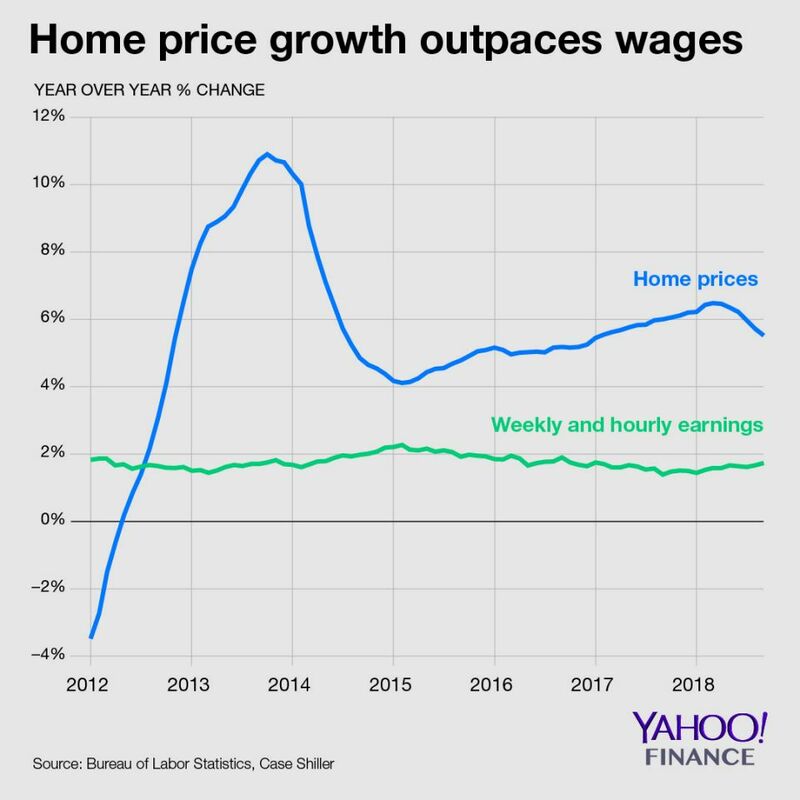 I think he means wages when he says “home income growth” but he is making a point which we have seen in many places where house price growth has soared and decoupled from wage growth. This has been oil by the way that central banks slashed official interest-rates which reduced mortgage-rates and then also indulged in large-scale bond buying which in the US included Mortgage-Backed Securities to further reduce mortgage-rates. This meant that affordability improved as long as you were willing to look away from higher debt burdens and the implication that should interest-rates rise the song “the heat is on” would start playing very quickly. Or if you wish to consider that in chart form Yahoo Finance helped us out. That is a chart to gladden a central bankers heart as it shows that the policy measures enacted turned house prices around and led to strong growth in them. The double-digit growth of late 2013 and early 2014 will have then scrambling up into their Ivory Towers to calculate the wealth effects. But the problem is that compared to wage growth they moved away at 8% per annum back then and the minimum since has been 2% per annum. That means that a supposed solution to house prices being too high and contributing to an economic crash has been to make them higher again especially relative to wages. What about house price growth now? Yesterday provided us with an update. CoreLogic® (NYSE: CLGX), a leading global property information, analytics and data-enabled solutions provider, today released the CoreLogic Home Price Index (HPI™) and HPI Forecast™ for February 2019, which shows home prices rose both year over year and month over month. Home prices increased nationally by 4 percent year over year from February 2018. On a month-over-month basis, prices increased by 0.7 percent in February 2019. So there has been a slowing in the rate of growth which is reflected here. “During the first two months of the year, home-price growth continued to decelerate,” said Dr. Frank Nothaft, chief economist for CoreLogic. “This is the opposite of what we saw the last two years when price growth accelerated early. Looking ahead they do however expect something of a pick-up. That gives us another perspective on the change of policy from the US Federal Reserve. So far its U-Turn has mostly been locked at through the prism of equity prices partly due to the way that President Trump focuses on them. But another way of looking at it is in response to slower house price growth which was being influenced by higher mortgage rates as the Federal Reserve raised interest-rates and reduced its bond holdings. This saw the 30-year mortgage-rate rise from just under 4% to a bit over 4.9% in November, no doubt providing its own brake on proceedings. If we look at monetary policy we see that perhaps something of a Powell Put Option is in place as at the end of last week the 30-year mortgage rate was 4.06%. Now bond yields have picked up this week so lets round it back up to say 4.15%. Even so that is quite a drop from the peak last year. There is also some real wage growth according to the Bureau of Labor Statistics. Real average hourly earnings for all employees increased 1.9 percent, seasonally adjusted, from February 2018 to February 2019. The change in real average hourly earnings, combined with a 0.3-percent decrease in the average workweek, resulted in a 1.6-percent increase in real average weekly earnings over this 12-month period. In terms of hourly earnings the situation has been improving since last summer whereas the weekly figures were made more complex by the drop in hours worked meaning we particularly await Friday’s update for them. Moving to the economy then recent figures have been a little more upbeat than when we looked at the US back on the 22nd of February but not by much. The New York Fed Staff Nowcast stands at 1.3% for 2019:Q1 and 1.6% for 2019:Q2..News from this week’s data releases left the nowcast for 2019:Q1 unchanged and decreased the nowcast for 2019:Q2 by 0.1 percentage point. Of the main data so far this week we did not learn an enormous amount from the retail sales numbers from the Census Bureau. percent (±0.5 percent)* from the previous month, but 2.2 percent (±0.7 percent) above February 2018. As these are effectively turnover rather than real growth figures a monthly fall is especially troubling but January had been revised higher. As to the overall picture this from Corelogic troubles me. According to the CoreLogic Market Condition Indicators (MCI), an analysis of housing values in the country’s 100 largest metropolitan areas based on housing stock, 35 percent of metropolitan areas have an overvalued housing market as of February 2019. The MCI analysis categorizes home prices in individual markets as undervalued, at value or overvalued, by comparing home prices to their long-run, sustainable levels, which are supported by local market fundamentals (such as disposable income). Only 35% overvalued? Look again at the gap between house price rises and wage rises in the Yahoo chart above. So if we look backwards very few places must have been overvalued just before the crash. Also times are hard for younger people. I am not sure that goes with the previous research. Also if the stereotype has any validity times for millennials in the US are grim or should that be toast? The price for Hass avocados from Michoacán, Mexico’s main avocado producing region, increased 34 percent on Tuesday amid President Trump’s calls to shut down the U.S.-Mexico border ( The Hill). Let me end with a reminder from CoreLogic that averages do not tell us the full story. This morning has brought us up to date with news from what the Men at Work described as. That is of course what was called Australis and then Australia and these days in economic terms can be considered to be the South China Territories. The monetary policy statement from the Reserve Bank of Australia (RBA) reinforces the latter point as you can see. The outlook for the global economy remains reasonable, although growth has slowed and downside risks have increased. Growth in international trade has declined and investment intentions have softened in a number of countries. In China, the authorities have taken steps to ease financing conditions, partly in response to slower growth in the economy. One needs to read between the lines of such rhetoric as for a central banker “remains reasonable” is a little downbeat in reality as we note the following use of “declined” “softened” and “slower”.But he was providing a background to this. In essence the heat is on for another interest-rate cut and if you are wondering why? There is this. GDP rose by just 0.2 per cent in the December quarter to be 2.3 per cent higher over 2018. Growth in household consumption is being affected by the protracted period of weakness in real household disposable income and the adjustment in housing markets. The drought in parts of the country has also affected farm output. I will come to the central bankers fear of negative wealth effects from what they call an “adjustment in housing markets” in a moment as we note they cannot bring themselves to mention lower house prices. The pattern of GDP growth looks really rather poor as we see that the trend goes 1.1%,0.8% and then 0.3% and now 0.2%. So we see a familiar pattern of much weaker growth in the second half in 2018 which if we see again in the first half of this year will see the annual rate of growth halve. Actually it may be worse than that as the only factor driving growth according to Australia Statistics was this. Government final consumption expenditure increased 1.8% during the quarter contributing 0.3 percentage points to GDP growth. So without it the economy would have shrunk and Australia might be on course for something it has escaped for quite a while which is a recession. Also according to the Australia Treasury Budget from earlier it is planning a dose of austerity. The total turnaround in the budget balance between 2013-14 and 2019-20 is projected to be $55.5 billion, or 3.4 per cent of GDP. The Government’s plan for a stronger economy ensures it can guarantee essential services while returning the budget to surplus. This budget year will see a surplus of $7.1 billion, equal to 0.4 per cent of GDP. Budget surpluses will build in size in the medium term and are expected to exceed 1 per cent of GDP from 2026-27. So as you can see it seems unlikely that government spending will continue to boost the economy. Also as they are assume growth of 2.25% then those numbers as so often seem rooted in fantasy rather than reality. Next if we switch back to the RBA the austerity plan comes at this time. In Australia, long-term bond yields have fallen to historically low levels. In fact they fell to an all time low for the benchmark ten-year at 1.72% recently and is spite of a bounce back are still at a very low 1.82%. So yet again we are observing a situation where countries borrow heavily when it is expensive and try in this instance not to borrow at all when it is cheap. I know it is more complicated than that but we also have this into an economic slow down. The Government is focused on reducing net debt as a share of the economy, which is expected to peak in 2018-19 at 19.2 per cent of GDP. The Government is on track to eliminate net debt by 2029-30. So it may look to be Keynesian but reality seems set to intervene especially on the economic growth forecasts. Again we see that the Governor of the RBA cannot bring himself to say, falling house prices. It is apparently just too painful. The adjustment in established housing markets is continuing, after the earlier large run-up in prices in some cities. Conditions remain soft and rent inflation remains low. Even worse it has implications for “the precious”. At the same time, the demand for credit by investors in the housing market has slowed noticeably as the dynamics of the housing market have changed. Growth in credit extended to owner-occupiers has eased. Indeed a central banker would have his/her head in their hands as they see the negative wealth effects in the latest quarterly national accounts. Real holding losses on land and dwellings were $170.8b. This marks a fourth consecutive quarter of losses and reflects the falling residential property prices over the past year. ……The real holding losses have translated into the first fall in household assets (-1.5%) since the September quarter 2011. Household liabilities increased 1.0%. Some of the latter was falling equity prices which have since recovered but house prices have not. Here is ABC News on the first quarter of 2019. On a national basis, the average house price fell 2.4 per cent to $540,676, and apartment prices dropped 2.2 per cent to $484,552 during that period. CoreLogic observed that markets which experienced their peaks earlier had experienced sharper downturns. Darwin and Perth property prices skyrocketed during the mining boom, but peaked in 2014. Since then dwelling values in both capitals have fallen by 27.5 per cent and 18.1 per cent respectively. So it seems likely that the value of the housing stock fell again. If we move to the official series we see that in the rather unlikely instance you could sell all of Australia’s houses and flats in on e go then from the end of 2015 to early 2018 the value rose by one trillion Aussie Dollars from a bit below 6 trillion to a bit below 7. Now in a development to pack ice round a central bankers heart it has fallen to 6.7 trillion officially and if we factor in other measures is now 6.6 trillion Aussie Dollars and to quote Alicia Keys. Australia escaped the worst of the credit crunch via its enormous natural resource base. According to the RBA index of commodity prices that has not ended. Preliminary estimates for March indicate that the index decreased by 0.9 per cent (on a monthly average basis) in SDR terms, after increasing by 5.3 per cent in February (revised)…….Over the past year, the index has increased by 11.0 per cent in SDR terms, led by higher iron ore, LNG and alumina prices. The index has increased by 16.6 per cent in Australian dollar terms. But now we see that the domestic economy has weakened whilst the boost from above has faded. If we look ahead and use the narrow money measures that have proved to be such a good indicator elsewhere we see that the narrow money measure M1 actually fell in the period December to February. If we switch to the seasonally adjusted series we see that growth faded and went such that the recent peak last August of Aussie $ 357.1 billion was replaced by Aussie $356.1 billion in February so we are seeing actual falls on both nominal and real terms. Thus the outlook for the domestic economy remains weak and could get weaker.